Take your business "on the road" with our "Welcome To Glocester" Sign Program! Showcase your business for six months at one of four entry points to Glocester for a nominal fee. Contact Vinny Lepore at 568-0200. 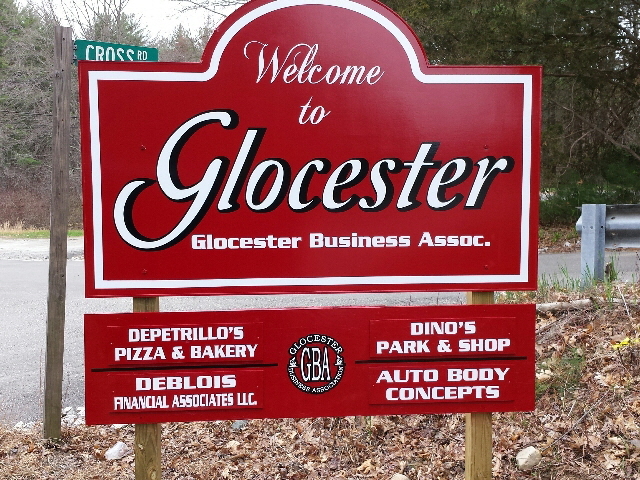 For a $250.00 payment to the GBA, you are eligible to receive your business name placed on an approximately 30" by 6" sign, below one of the four "Welcome to Glocester" signs maintained by the GBA, for a period of six (6) months. The six (6) month period will run from May 1st to October 31st (Session A), and from November 1st to April 30th (Session B). An application form for the Members Only Sign Program will be sent via U.S. Mail to all Glocester Business Association members twice each year. Applications for Session A will be accepted from March 15th to March 31. Applications for Session B will be accepted from September 15th to September 30th. Individual business sign location will be on a "first-come, first-served" basis determined by postmark and desired location. Should your desired location be unavailable, we will contact you to discuss alternate placement. Due to size restrictions, the layout of the sign will provide your business name or, in the case of certain businesses, a shortened version with your approval. To participate in the program, complete the application form, then mail the form and a check made payable to "Glocester Business Association" to Glocester Business Association, PO Box 327, Chepachet, RI 02814. There is no automatic renewal of your business placement on the sign; you must reapply for each six (6) month period. However, any former sign holder shall pay a renewal fee of only $200.00 to renew for any subsequent session. Member signs will be retained by the Glocester Business Association following the session and kept on file for future sponsorship opportunities.